Santana players in action on Monday night against Del Norte. SANTEE ( 11-26-2018 ) – The jury is not yet ready to make an accurate description of how young and inexperienced the 2018-19 Santana Sultans as of yet. In reference to the jurors in this case, we are speaking of friends, family, coaches and media, it is much too early in deliberations to provide an accurate verdict. 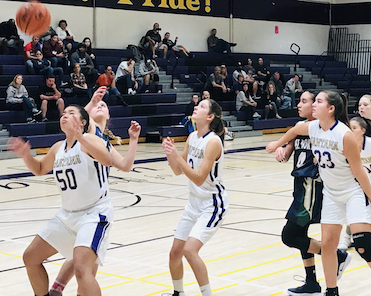 However, the Santana Lady Sultans have come out swinging at times, just haven’t put together the dead Coach Jordan Franey, “Family Recipe of Success” just yet. Santana junior ISIS TAYLOR passes the ball against Del Norte on Friday night. 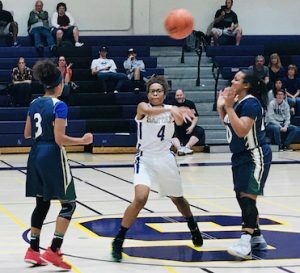 Anyone familiar with East County hoop is familiar with the Franey family, and they were some of the most successful and entertaining girls and boys on the court. With that being said, the 2018 Sultans are going to be a force to be reckoned with, so let us gently toss out the 0-4 start, and see a new Santana legacy start construction. Monday evening was an example of the youth and inexperience, leading to a plethora of turnovers, and frustrating miscues. Remember folks, with desire and hard work, a veteran coaching staff, and the desire to improve, this young group of ladies are competitors just waiting to have a breakout game. Monday night, the Sultans came out firing very early on a 5-2 run that unfortunately would diminish very quickly. Santana would score nine total points in the first quarter while Del Norte (2-1) amassed 30 points. One of the Nighthawk players that was a terror for the Sultans, junior INDIA STARR, who has been averaging 18.3 points a game and was the MaxPreps Player of The Game. Unfortunately, Santana was down at the half, 48-15. One of the standouts for the Sultans on the evening was sophomore JOEY BARKHIMER, who showed great resilience while on the court at all times. The third quarter was still tough as the hosts were outscored, 19-4, improving at the end and some help from a running clock ended up 7-7, only 14 points scored in the fourth total, with the final being a heartbreaker, 74-26, Nighthawks. Notable on the evening, freshman BELLA TERRY scored 11 points, five rebounds, while Barkheimer had five rebounds, one steal, and two points, and senior AALIYAH STONE had four points and four rebounds. CHULA VISTA 41, HELIX 40 – The Highlanders dropped their season-opener in a Matador Classic game. MORSE 57, STEELE CANYON 41 – The Tigers won their season-opener the tournament contest, sending the Cougars to 0-2. TORREY PINES 55, WEST HILLS 17 – The visiting Falcons defeated the Wolf Pack, which travels to play Canyon Crest on Thursday. If anyone can bring the glory days back to SHS Girls Basketball, it’s Jordan Franey! Basketball Hall of Fame recipient (SHS) that played under one of the “Winningest Coaches” in CIF history, Wade Vickery! This woman knows the game and has the energy and passion to bring back championships. A little time and support and Sultan bb will be back where it belongs! Sultans forever.